August | 2018 | Park View, D.C. 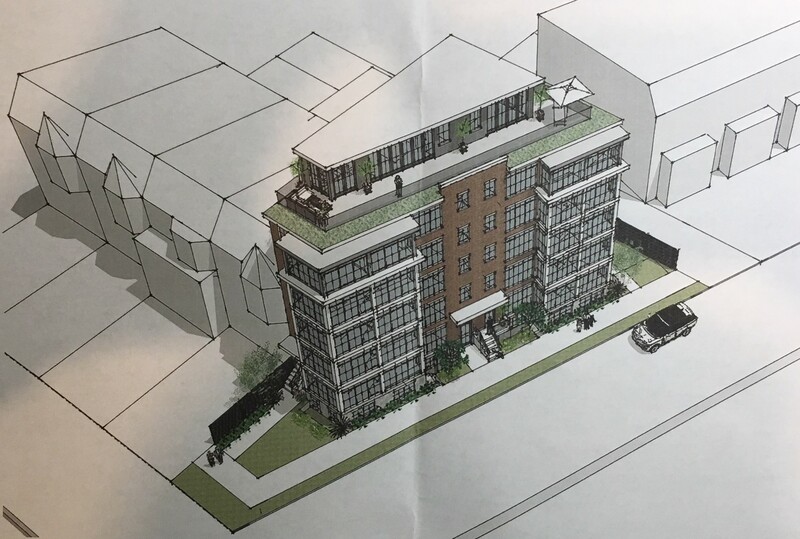 In July, ANC1A was asked for a letter of support to raze the building at 3601 14th Street, NW, in order for the owners to build a new 10-unit building on the site. At the July ANC meeting, there was some confusion about the request as ANCs do not have authority to officially weigh in on raze applications and no Commissioner could think of a previous time when anyone had come to the Commission seeking support for a raze permit. We all agreed that we appreciated the opportunity to discuss the project as well as provide the community with details and that it would be great if other developers would do it. At the end of the discussion, ANC1A voted unanimously to support the raze application. 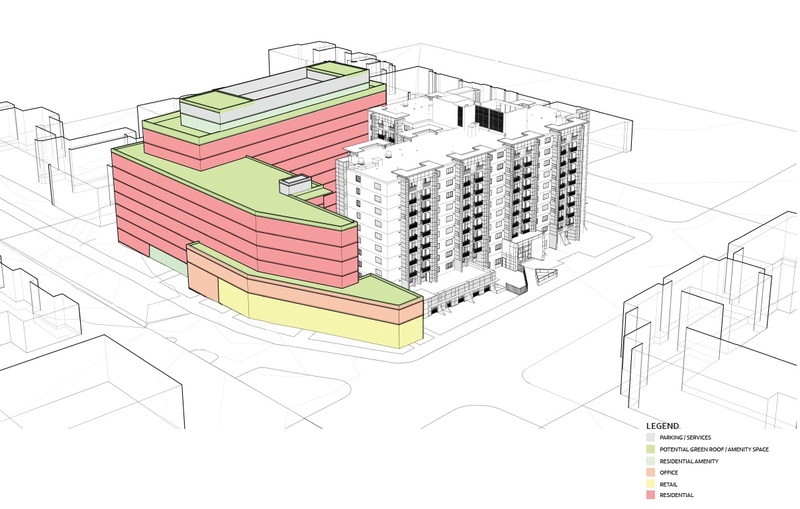 The resulting building will have 10-units, meaning that it will have to provide one-unit as an Inclusionary Zoning unit. The building will be built entirely by-right, will conform with zoning, and is not seeking a parking variance. The architects for the project are Arcadia Design. 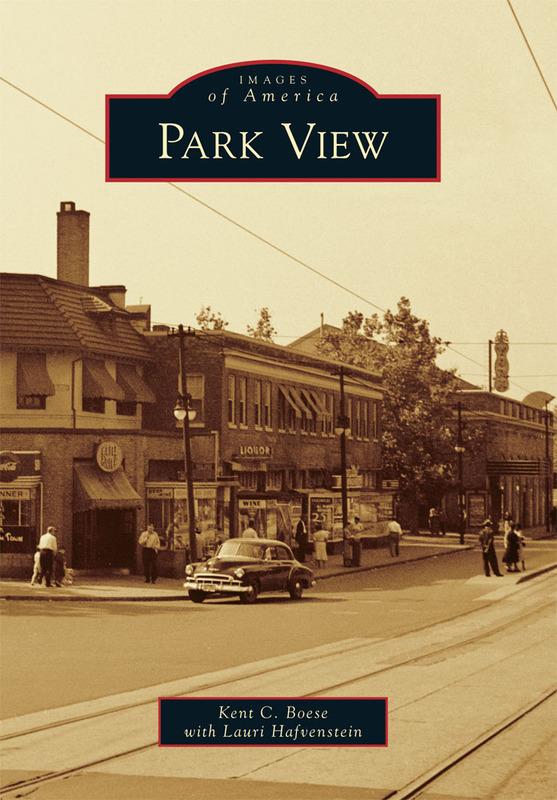 Initially, both Commissioners Valerie Baron and Kent Boese recognized the structure as once being the location of a mikvah and were concerned about any historic or cultural importance of the building, especially as there are few buildings that directly relate to the Jewish community that lived in the neighborhood during the 1920s-1960s. 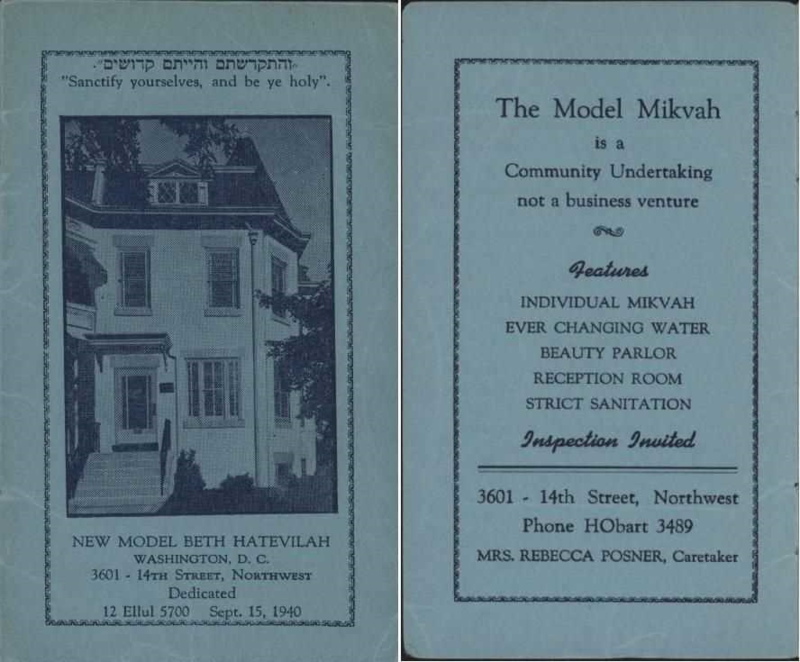 In September 1940, a new community mikvah was dedicated on 14th Street, NW, within walking distance of the Beth Sholom Congregation, the Jewish Social Service Agency, and the Hebrew Home. (Above is the front and inside cover of the mikvah’s rules/regulations booklet.). 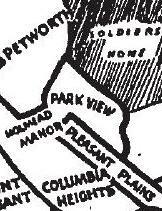 After consulting with the Historic Preservation Office and the Jewish Historical Society of Greater Washington it was determined that there was nothing architecturally significant about this property as it related to the mikvah. The structure was originally constructed as a residence and converted only later to a mikvah. With this understanding, it was agreed that razing the structure could be supported. The owners did agree to a request from the ANC to allow interested members from the historic societies access to tour and photograph anything that may remain of historic interest prior to razing. Below are additional images of the planned new structure. In July, artist Maryanne Pollock came before Advisory Neighborhood Commission 1A seeking a letter of support for an art project she is working on for Wangari Gardens. 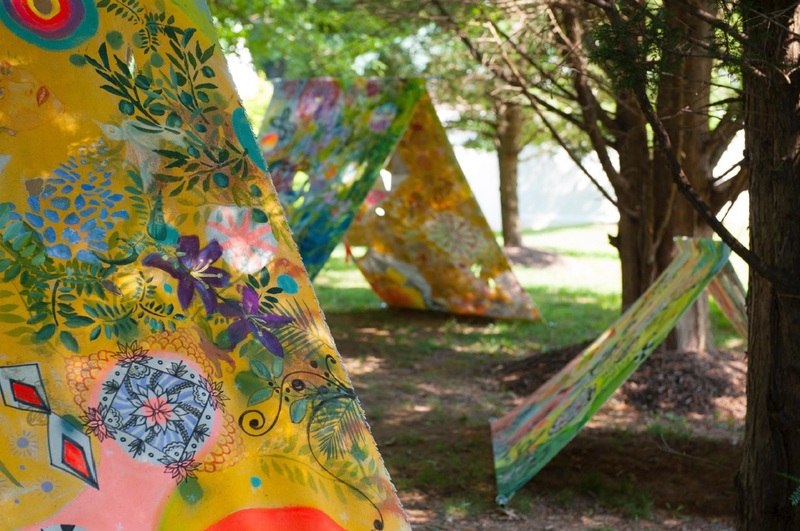 ANC1A unanimously supported the art project and supplied a support letter (read letter here) to be included in Pollock’s DCCAH Public Art Grant application. 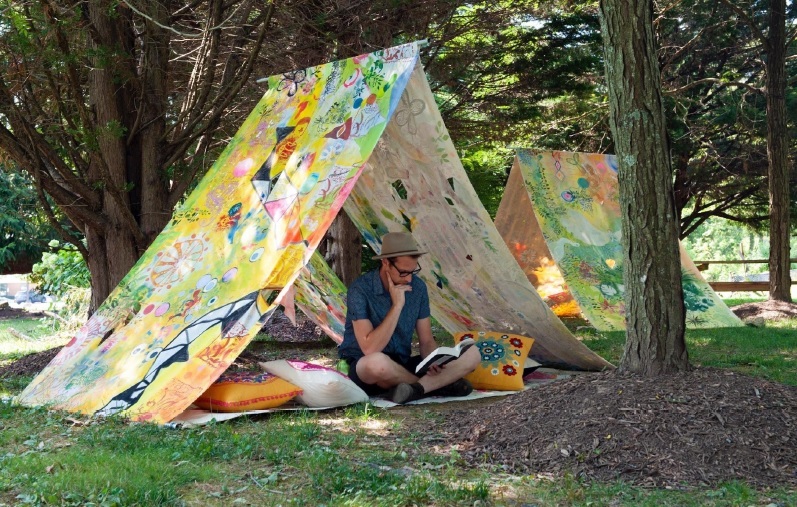 If successful, Pollock’s proposal is to make collaborative hand painted tent murals during a free event for the community that will celebrated at Wangari Gardens and then to organize a picnic in the late spring or early fall of 2019. Pollock has already successfully done similar art projects in Maryland, Delaware, and Scotland. 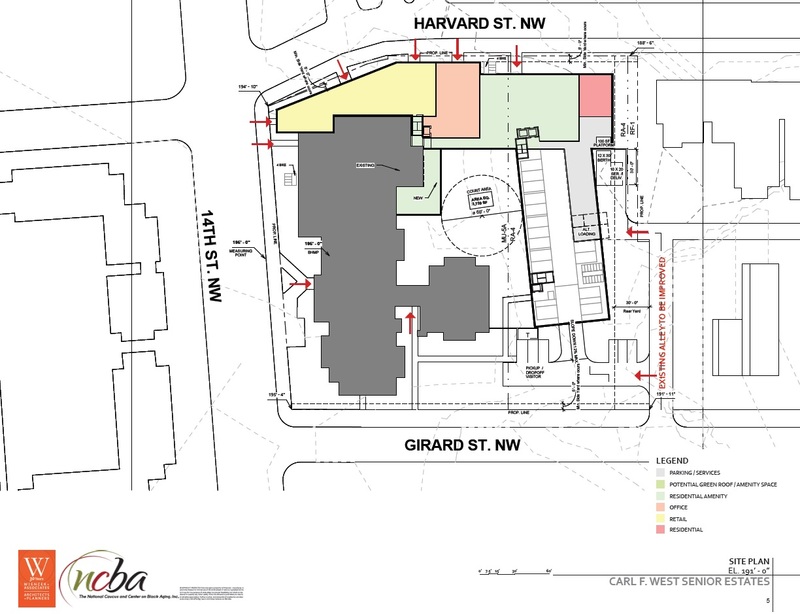 Last week, ANC1A Commissioners Margaret Hundley and Kent Boese were invited to a meeting with National Caucus & Center on Black Aging, Inc. (NCBA) leadership about plans to expand the Samuel J. Simmons NCBA Estates property located at 14th Street between Harvard Street and Girard Street, NW. NCBA is an organization dedicated to the physical, economic, social and financial wellbeing of low-income African American senior citizens. The Simmons Estates property currently provides 175 units of housing for seniors. 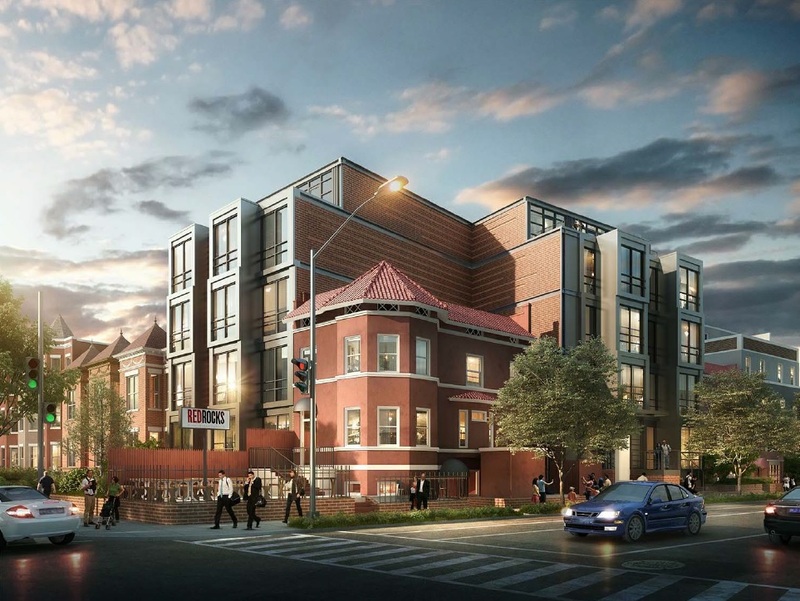 The purpose of the meeting was to inform ANC1A about their plans to expand their Columbia Heights facility and request that the Commission provide a letter of support — which ANC1A will consider at their September 12th meeting. There is a possibility that the new building could include approximately 5,000 sq. ft. of retail space at the corner of 14th and Harvard as well at NCBA’s main office. 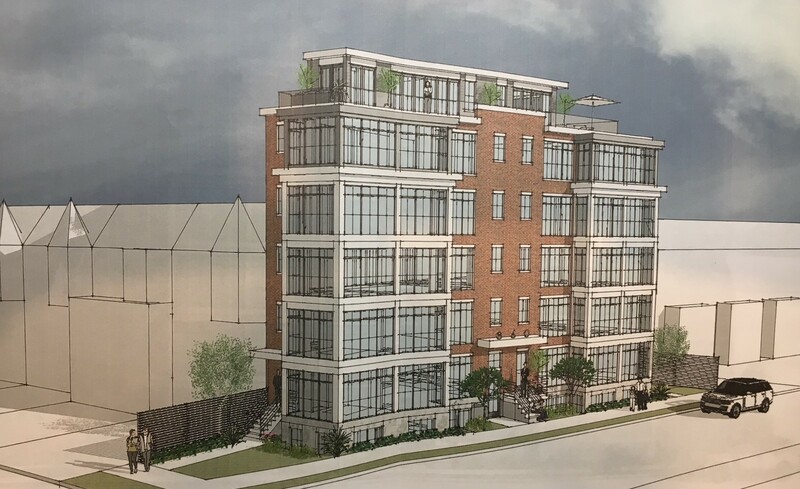 It is too early to tell what the new building might look like, but NCBA provided the following drawings that help give a sense of the siting, massing, and relationship of the new building with the existing apartment building. 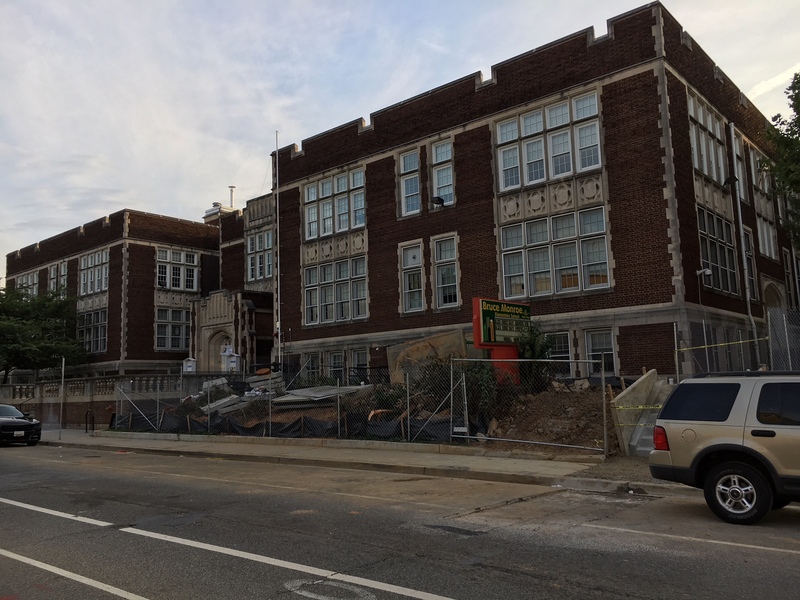 The current construction at the Bruce-Monroe @ Park View school is still going strong, and while most of the results will primarily benefit the students and teachers at the school, I think there is an opportunity to create a significant benefit for the entire community. I’ve noticed that the majority of the grounds in the front of the building have removed the landscaping from the Warder Street side of the property. When it is time to replant those areas, we need to include new trees that will mature to provide shade for that block. A few years back the law was changed to allow DDOT’s urban forestry administration to also plant on public property like schools and recreation centers. Based on my quick review, we should be seeking to get an additional 3-4 trees on this block. 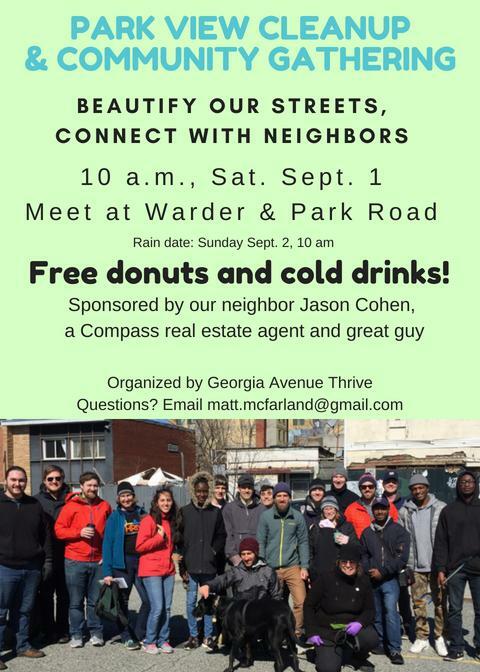 I’ve already reached out to both DDOT and the construction crew to begin this conversation. 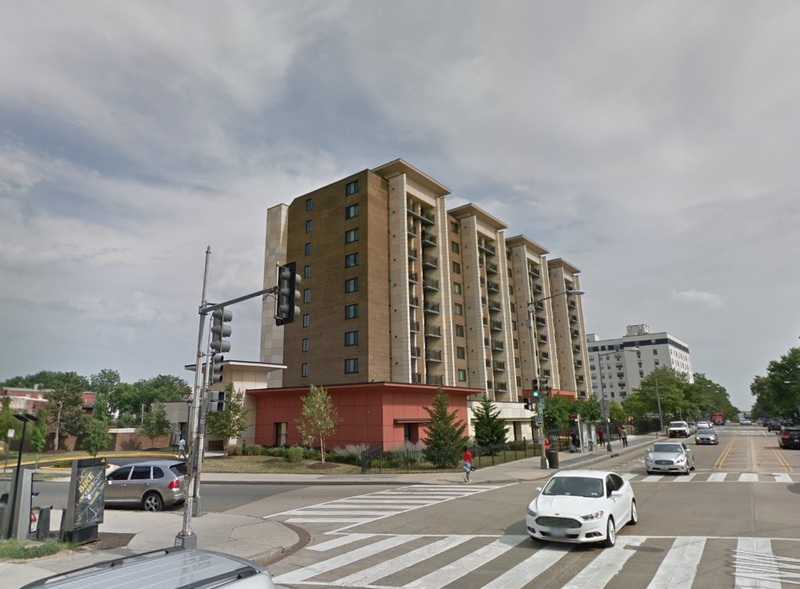 A new zoning case (BZA 19862) was just filed that proposes to combine the four separate lots surrounding Red Rock Pizza in Columbia Heights and replace the existing rowhouses with a new four-story, 26-unit apartment building. The height of the Project will rise to no greater than 50 feet as permitted in the MU-4 Zone. The applicant will be seeking relief from the four parking spaces required by zoning. 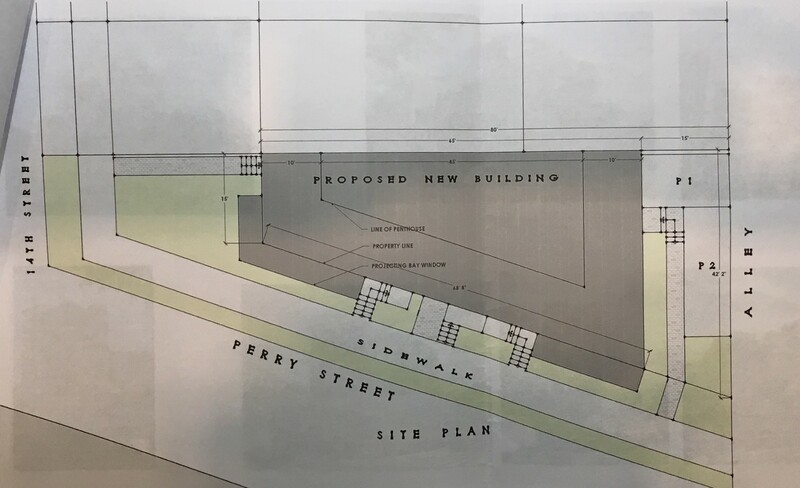 The reasoning behind this request is that the four properties in question currently to not have off-street parking or access to the alley in the middle of the block. 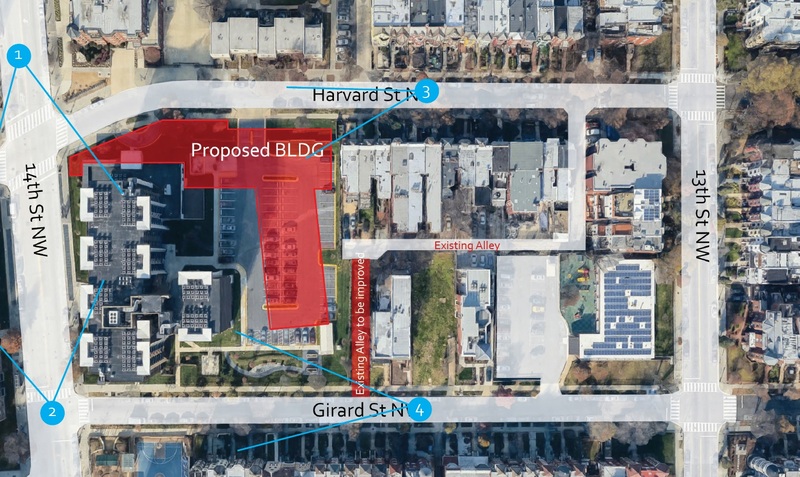 Furthermore, due to the close proximity to the intersection of 11th and Park Rd., DDOT will likely not grant a curb-cut for off-street parking. In thinking about transit close to this property, the 64, H8, and 63 bus lines all have stops across the street or on Sherman Avenue, there is a Capitol Bikeshare station at the intersection, and both the Columbia Heights and Georgia Avenue Metro rail stations are within a 10-15 min. walk. Currently, this BZA case will likely be on the October ANC1A agenda, with a community meeting in late September. More details can be found on the Zoning Website. 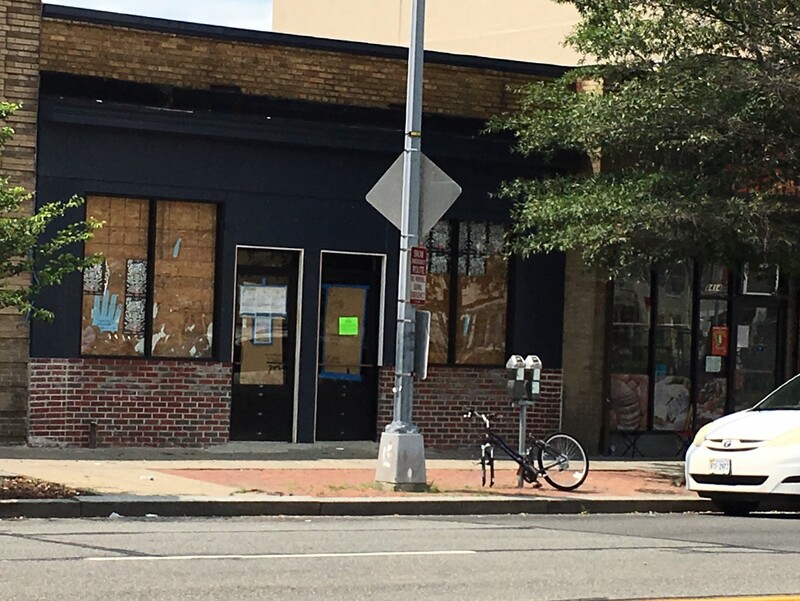 The small storefront at 3412 Georgia Avenue (next to Kraken Axes) is finally starting to show some progress after it appeared to stall in late 2017. According to building permits, the new business will be La Herradura Super Market and will be about 2,896 sq. ft. of space. The original permit was issued in February 2016, with a 1st extension in July 2017 and a 2nd extension in October 2017. In asking around, I understand that the latest hurdle in their efforts was appealing a vacant tax bill that the city had levied due to the slow progress. While I know that the District is attempting to crack down on vacant property, which I applaud, I feel they are overly aggressive with some of these slower developments in our area. While I;m sure I’m not along is saying I would like them to move more quickly, financing can be an issue and I don’t believe that DC supports our small business community as well as we should. Given the choice between getting this property renovated slowly or vacant and unusable for years, I’ll take the slower path as long as there is progress.